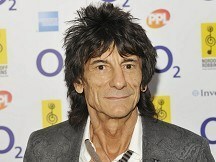 Ronnie Wood is getting his own television show. The Rolling Stone, whose show on Absolute Radio has picked up several awards, will present The Ronnie Wood Show on Sky Arts from February next year. The format will see him joined in the studio by guests and music business friends and feature live performances and interviews. He said: "I've had so much fun doing my radio show and had lots of success with recent awards, so I'm really excited it's now going to TV to give the audience the chance to see behind the scenes." DJ Jo Whiley also gets her own show about the music industry and will present a spin-off, Jo Whiley Live, featuring bands playing extended sets. She said: "Doing a show like this with Sky Arts is a hugely exciting project for me. Performance is going to be a big part of both shows; getting on the established acts but also the opportunity to give new bands a showcase on the channel. "I'm delighted to be part of a programme that gives a forum to debate the complex issues facing the music industry today, and I'm looking forward to giving our guests the opportunity to really speak their mind." Her show starts in October. Channel director of Sky Arts James Hunt said both shows would be "innovative and exciting".